A sophisticate and stylish appliance made of eco-friendly heat-resistant glass with attractive blue illumination is a perfect choice for a pleasant teatime! The blue illumination is enabled when water comes to a boil and the kettle truly fascinates you by its radiance. 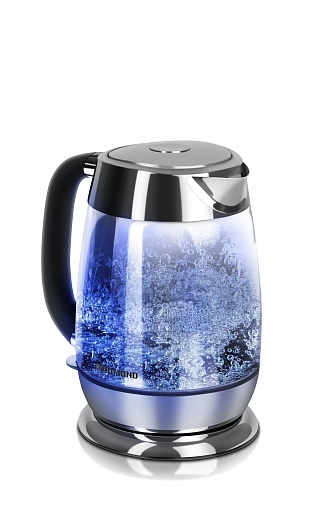 The kettle has a capacious volume (1,7 l) and a removable anti-scale filter for convenient use. The kettle automatically turns off when it lacks water, when water comes to a boil and when it's removed from the base that guarantees an absolute safety in use. The illustrated tea recipe book with delicious tea and tea drink recipes for a special occasion comes fitted with the appliance. If it's an electric kettle, look no further than REDMOND!